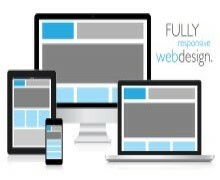 Website Design Falkirk – We offer fully responsive web design for all your needs, whether it’s for a business or a local club or charity. We can create different types of website with all kinds of features that you may need, dependant on the types of business and it’s requirements. Our sites are all dynamic so they will be displayed properly across all devices, Computers, Phones and Tablets. We do everything for you from helping you register the domain name, we also supply the webspace and host the site. Additionally we can help you with logo design and additional artwork. Search Engine Optimisation (SEO) is another service we can offer in order to get your site found higher in the search engine results. We can create as many email addresses that you require and even help assist you in setting these up on you phone and computer. Working with our team of designers we can have a website up and running in 1 – 2 weeks. Smaller sites can be up and running in as little and 2-3 Days. For ultra fast projects we can have people working around the clock to get a small site live in 24 – 48 hours.